It’s a never-ending challenge in your insights department: getting business decisions made based on completed projects. If it’s any consolation, you aren’t alone. A recent Quirk’s Report found that 85% of researchers can’t get action based on insights at least some of the time. So, how can you increase insights-based decisions? They key is aligning the research and business objectives at the start. That’s one way to produce insights that get action. So how do you do that? By becoming a strategic partner. It’s not easy, but if you start asking probing questions that challenge assumptions, you will find it easier to identify hidden assumptions and hypotheses. When you bring in all stakeholders, you get a 360° view of the actual needs. With that understanding in hand, you shouldn’t be afraid to ask for commitment up front and in return, commit to keeping in touch in case things change. If you want to produce insights that get action, use these five methods to align insights projects with business objectives. Just because your business partner identifies a challenge doesn’t mean it is the gospel. Imagine this situation: you come into the office early and start browsing your email. There’s an urgent email from the brand team. A competitor has dropped prices and they need to decide if a price reduction is in order. They ask if you could “do some groups” on pricing. Now on the surface, that may seem like a straightforward request. It would be very easy to immediately start building a focus groups plan around this problem. You might cover exploratory topics like consumer belief about the competitor and your products and explore how they feel about the price cut and its impact on quality perceptions. But imagine how you would feel if as you are reporting results, you find out that the competitor lowered prices as a preemptory move because they were under investigation for poor business practices. The price drop was just a move to get a better foothold on their market share to offset losses incurred when the bad news was revealed. The price decline wasn’t based on a marketplace need, as was assumed by your brand team. You would know in an instant your research results aren’t valid. Consumers might have had different opinions if they had known all the facts. Why didn’t you know the “rest of the story”? This may be an extreme example, but “surprises” at the reporting stage are an unfortunate fact of life for many insights teams. It happens because either business partners aren’t fully aware of the situation they face, they don’t think a certain fact is relevant, or they simply forget to share all relevant information with the insights team members. When this happens, the insights aren’t used to make business decisions and the resources used to conduct the research are wasted. So, ask probing questions to get better understanding. Use clarifying probes (tell me more about…) and elevating probes (let’s take a step back…) to make sure you completely understand the business needs before moving on to the actual research needs. Don’t be afraid to challenge assumptions. You aren’t going to get a 360° view by looking from one angle. To align the research with business objectives you must spin the current situation around and look at it from different perspectives. So, get the full picture by identifying all business units/functions that will be impacted by the decision and talking to all stakeholders. Marketing, R&D, operations, and insights should all be working together to deliver a brand, product, or ad campaign that perfectly meets the consumer needs and thus create more value for the business. According to an article in the Harvard Business Review, in the perfect organization, R&D and marketing serve as the perfect counterbalance to each other. But organizations aren’t perfect. Marketing, R&D, operations, and insights should all be working together to deliver a brand, product, or ad campaign that perfectly meets the consumer needs and thus create more value for the business. That’s why it’s up to you to interview as many stakeholders as possible to ensure the insights project is truly focused on business objectives. You may find by talking to other stakeholders that the actual needs have been lost in translation or the project is much further down the road than you thought. It isn’t always easy but including all stakeholders as well as managing their expectations and understanding what drives their aspect of the project is well worth the effort. It’s also a great way to uncover past relevant, related research, information, data, or competitive intelligence that you might not have otherwise uncovered. Lastly, getting the opinions of all stakeholders leads to better understanding the current situation and helps identify what is out of scope of the project. Understanding what is out of scope is crucial. It leads us to the next tip. As part of understanding business need objectives, you must identify and understand the underlying hypotheses and expectations. Don’t wait until reporting to find out that your business partners have unstated expectations. That’s too late. Go ahead, ask your business partners up front what they believe they will hear. Just start by having your business partner imagine the results they will get from the study. Then ask them if this information will be all that’s necessary to make a business decision. Also, probe how they will react if the results are not what they expect. In our e-book, Research Without Regret, we look at a case study where a brand team didn’t share their performance expectations for a new flavor with the insights team. Considerable resources were invested in the research, but when the results were contrary to expectations, the research was called into question – not the expectations. Has this ever happened to you? If so, download the e-book to discover how this can be prevented. By probing the underlying hypotheses and expectations as well as understanding what is out of scope, you will better prepare your partners for unexpected results. When insights projects are properly aligned with business objectives, they not only provide the information necessary to decide what to do, they inform what not to do. After all, if research only confirms what is already known, it’s not a vital business function. Identifying what is out of scope is also critical to avoid misunderstandings about deliverables and eliminates some of the second guessing that can happen at the end of the project. You may be allergic to commitment in personal relationships, but that’s a bad strategy for your professional relationships. Especially with your business partners. When discussing the business decisions to be made, ask not only “What must you learn from this research to support these business decisions?” but then ask, “How much of the business decision will be impacted by this research/analysis?” then get a commitment to use the information. Get a commitment on how the information will be used and identify other elements that will impact the decision as well. 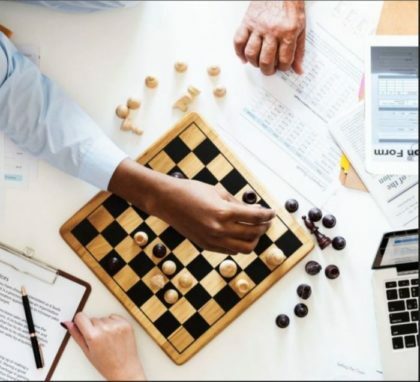 By getting buy-in at the start and doing the groundwork to make sure the research is aligned with business objectives upfront, you will produce insights that get action. If you can’t get commitment to use the information, can you afford the opportunity cost? It may be too high. It’s a tough tightrope to walk, but in this instance, the company may be best served if resources were directed to other projects. It’s a fact: insights professionals are constantly faced with too many projects and too little staff. Quirks Reports that 85% of insights professionals find this to be a pain point in managing and conducting research. So, get commitment up front. You may find that over time, you are pulled in earlier and earlier as you prove ROI on insights projects that align with business objectives and get action. By getting buy-in at the start and doing the groundwork to make sure the research is aligned with business objectives upfront, you will produce insights that get action. These days, many insights projects can take six weeks or more to design and conduct. In a rapidly changing environment, that’s a lifetime. Almost anything can happen. The research team must be kept informed of any major external market factors that change during this critical period. Initiate contact frequently during this period. Don’t wait for your business partner to come to you, reach out on a regular basis. Ask if there are changes in the marketplace that could impact the research. Changes in competition, customers, resources, technology, or regulation can impact research. Since marketplace intelligence during the project is vital to success, check in frequently. If changes occur, then you can make field corrections if appropriate or address the changes in the analysis and reporting phases. By implementing these processes, you’ll be much more than just a researcher. You’ll be a strategic advisor. When you deliver projects focused on business objectives, they get action. Have you found other ways to increase insights-based decisions based on alignment of research with business objectives? We’d love to hear more. Contact us and let us know what is working for you. 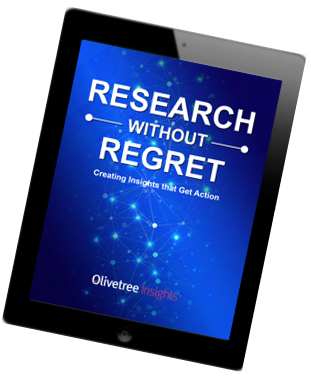 Download the ebook and discover tips for avoiding research that ends in regret.